Ms.Mintita Nitikornkulanun Managing Director 121 Creation Ltd.,Part. 121 Creation is a trade exhibition organizer and a publisher, offering publishing and marketing services. 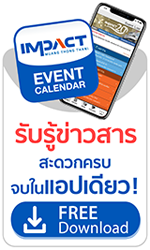 We started organizing our event at IMPACT Muang Thong Thani in 2010. From an initial exhibit space of 5,000 square meters, today IMPACT has expanded its space to 15,000 square meters. For the past 6 years, we have been very impressed with the first-class customer services delivered by the sales team as well as professional advice on the venues and other facilities by the Operations team and a great support from other relevant business units. A big thanks to IMPACT team! It is always a pleasure to work at IMPACT. They have a great modern facility which their management do a great job of maintaining and updating. The real pleasure though is working with their dynamic team. They are attentive and focused on offering you the best possible service. Herbalife International would like to thank IMPACT for the tremendous success of our bi annual events, Asia Pacific Herbalife Extravaganza. From the moment that the team were put in charge of the event, we knew we were in good hands. Led by Prasit and Nicha, the overall planning and hard work from every team member is greatly appreciated. The professionalism that the team brings to the table is commendable and the prompt response from each department contributed to the success of the event. With a complex setup and unique operational requirements of Herbalife, IMPACT delivered its promise of a world class venue suitable for an international audience. The various challenges across operations, F&B, traffic and crisis management were dealt with a keen eye to detail. The flexible approach demonstrates the willingness of the team at IMPACT to go the extra mile for the good of your event. IMPACT has proven to be Herbalife’s preferred choice of venue in Asia Pacific and we look forward to future partnerships.